You may pass another vehicle if the line dividing your lane from the lane you wish to enter is a ____ line. White lines separate traffic lanes traveling in the same direction. You may cross broken white lines to pass, as long as the passing lane is clear. 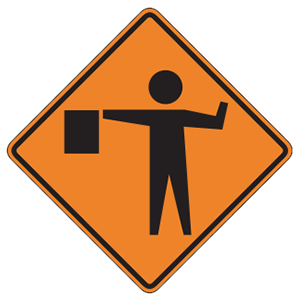 This sign indicates that there is a flagger ahead controlling traffic in a construction area. They’re difficult to see in traffic. They obey different traffic laws than larger motor vehicles. They always have the right-of-way. They don’t have rearview mirrors. In many collisions with motorcycles, bicycles, and pedestrians, drivers reported that they were looking but still did not see the smaller vehicle or pedestrian. 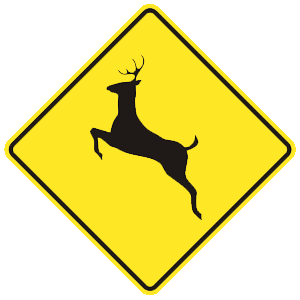 Motorists should stay alert to these other kinds of road users since they are more difficult to see than cars or trucks. Signal and keep your wheels turned to the left. Signal and keep your wheels straight. Flash your headlights so drivers will let you through. Drive around the rear of a car if it blocks you. You must always signal before turning or changing lanes. You should keep your wheels straight while waiting to make a left turn. If another vehicle hits you from behind, this ensures that you will not be pushed into oncoming traffic. Driving behind a large vehicle that blocks your vision. You should increase your following distance when you are behind a large vehicle that blocks your vision, when driving in bad weather or heavy traffic, when exiting an expressway, when behind a motorcycle or bicycle, and if someone is tailgating you. Is not required to stop. 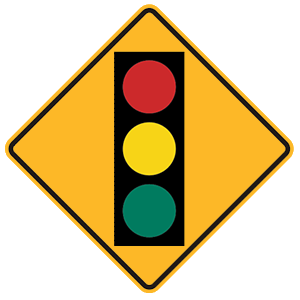 Is required to slow down to make sure crossing traffic is clear. Should stop only at a place where they can see at least 200 feet on either side, even if they have to enter the intersecting roadway. Should stop where they have a clear view of approaching traffic before they enter the intersecting roadway. 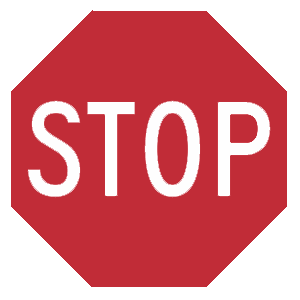 If there is no stop line or crosswalk, you should stop at the point nearest to the intersecting roadway where you can get a view of approaching traffic. You should not enter the intersecting roadway to gain a better view.